Just because you had a baby, doesn’t mean you have to sacrifice on style when it comes to diaper bags and backpacks. A long time ago, there really weren’t as many diaper bag options as there is today (YAY!). Here is my list of the best and most stylish diaper bags and backpacks so you can find the perfect one for you. In an effort to fully disclose, this article contains affiliate links which means that if you purchase something I receive a commission. It does’t change the price whatsoever. For more information, see my Disclosures/Advertising page. This diaper bag, like the skip hop duo, has a ton of storage pockets and the overall style of black and white stripes is classic. At first glance, it doesn’t even look like a diaper bag. Also like the Skip Hop Duo, it comes with a changing pad. It comprises of 11 pockets for storing all your basic necessities for your little one including an insulated pocket for keeping a bottle cool. This diaper bag can be found here on Amazon! While it doesn’t offer as many pockets as some of the others, this diaper bag is spacious. There are large pockets on the outside that could hold bottles, and the inside has plenty of room to pack all the essentials for your little one. It is made out of a canvas material so it would be easy to clean, just simply wipe it down. The design is also quite appealing! Check out this stylish diaper bag here on Amazon. MB Krauss makes a diaper bag that is on this list of most stylish diaper bags and backpacks. This diaper bag is just gorgeous! It has one insulated bottle holder in the inside of the bag as well as 12 different pockets for organization and storage. It has stroller straps to easily attach to the stroller, but I really never used stroller straps when I carried my diaper bag around. At first glance, it looks like a cute weekend bag and not anything like what you would expect a diaper bag to look like. Not only that, it also comes with a changing pad. If this is your kind of diaper bag, you can find it here on Amazon! This cute pink and navy blue diaper backpack has 13 pockets so you can organize all your baby essentials into this bag and easily access them. Not only that, in the back there is a zipper so you can access the bottom part of this backpack with ease instead of digging all the way to the bottom of a traditional bag. It definitely has it’s place here on the most stylish diaper bags and backpacks for both it’s cute design as well as it’s great functionality. You can find this diaper bag here on Amazon. Bag Nation believes in their product so much, they even offer a lifetime warranty! You really can’t beat that because things inevitably happen, but how great would it be to have a lifetime warranty and get the backpack replaced if you have problems? (I am a huge fan of anything that has a lifetime warranty!) If that doesn’t sell you right there, it also has 14 different pockets for storage and organization of all the things you pack for your baby. Like all these other stylish diaper bags and backpacks, it also comes with a changing pad and can be found here on Amazon. This sleek design offers 12 different pockets and compartments for storage and organization and the company also offers a 100% money back guarantee to a dissatisfied customer, so that is definitely a plus if you are on the fence and don’t know if you want to get this one or not. It is definitely functional, but still stylish enough that it can go with anything which is why it lands on this list of most stylish diaper bags and backpacks. If you are interested, check it out here on Amazon. Thank you for reading this list of the best and most stylish diaper bags and backpacks! 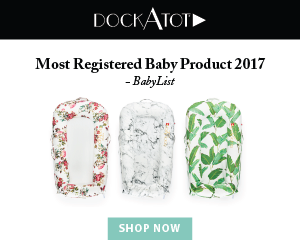 Now, it is up to you to pick your favorite so you can get yours packed and ready for your little baby. Picking might just be the hardest part because there are so many stylish diaper bags and backpacks to choose from. Give me a shout out below and let me know what you think. Also, don’t forget to subscribe to my blog for more sweet advice from one mom to another! I love how stylish these bags look! They really are, and what’s also nice is that they are still extremely functional for moms who need a diaper bag to fit everything! These bags are so cute, I love them all! Right?! They are so adorable!